On Tuesday 26th March, the Mayor of Hammersmith and Fulham visited the school on our ACHIEVE evening to hand out awards to the boys with the most ACHIEVE points. Throughout the evening we were spoiled by musical performances on the piano and guitar and were given excellent poetry recitals by Alex Sunderland in Year 8. Deputy Member of Youth Parliament, Year 9 student Jeffrey Mailli, read out his manifesto pledge on tackling gender stereotypes in schools. All winners received a certificate, badge and a book – kindly donated by Morgan Sindall. It was an amazing evening and we are so proud of all the students who achieved excellence this term. Year 7 having a fun filled day at KidZania. KidZania is an interactive city made for children that combines inspiration, fun and learning through realistic role-play. Children can independently explore a scaled city of over 7,000 square meters with more than 100 exciting careers that they can try. Year 8 and 9 had a very interesting trip to the National Army Museum and the Royal Hospital Chelsea. The Royal Hospital Chelsea is a retirement home and nursing home for some 300 veterans of the British Army. The National Army Museum is a leading authority on the British Army and its impact on society past and present. Year 11 had a trip to the Troxy Theatre for the “Strive for 5” Maths Student Conference. 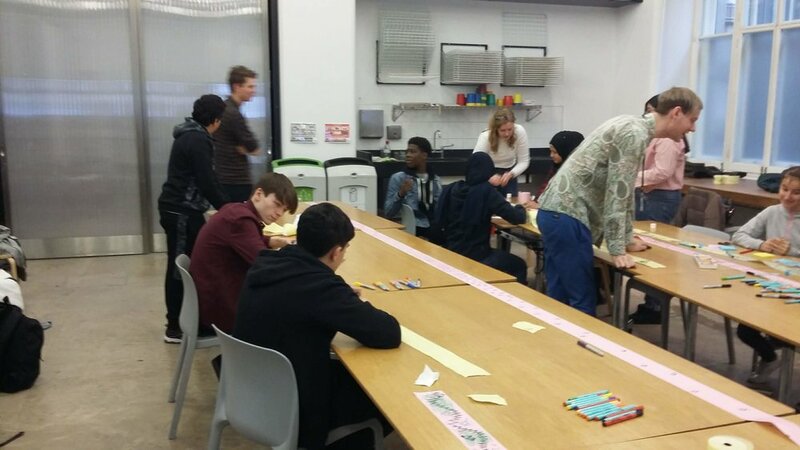 Students were put through their paces in a booster session using five key topic areas that will help to improve their revision skills. Other members of Year 11 stayed on site and were visited by Houston in education (theatre Company) where they were involved in drama workshops relating to their English examinations, which will take place later in the year. Well done to the Y10 football team after a good hard fought win over Holland Park School on 26th March. Marshal scored the opening goal of the game with a neat strike from a tight angle, Holland Park pulled back to 1-1 within 5min. Oliver stepped up for 2-1 lead, and as a typical yo-yo game goes, Holland Park answered, 2-2. Dylan added his name to the score sheet, 3-2 FCBS and a minute or so before the half Liam was rewarded for his efforts with a neat finish and a really good value 4-2 lead. The second half reflected the stronger of the teams and the power was with FCBS; awarded a penalty after a surging run by Tariq, he dispatched the spot kick as cool as you like for the 5th goal. Due respect to Holland Park who battled tirelessly to the end and scored a consolation goal before the full time whistle. However the damage was already done. Well done FCBS 5-3 winners!! Voting took place last week to elect a new Youth Mayor and members of the Youth Parliament following a poll of 8,000 young people across the borough. Votes were cast at 21 polling stations in schools and youth projects, across the borough, between 4 and 15 February. 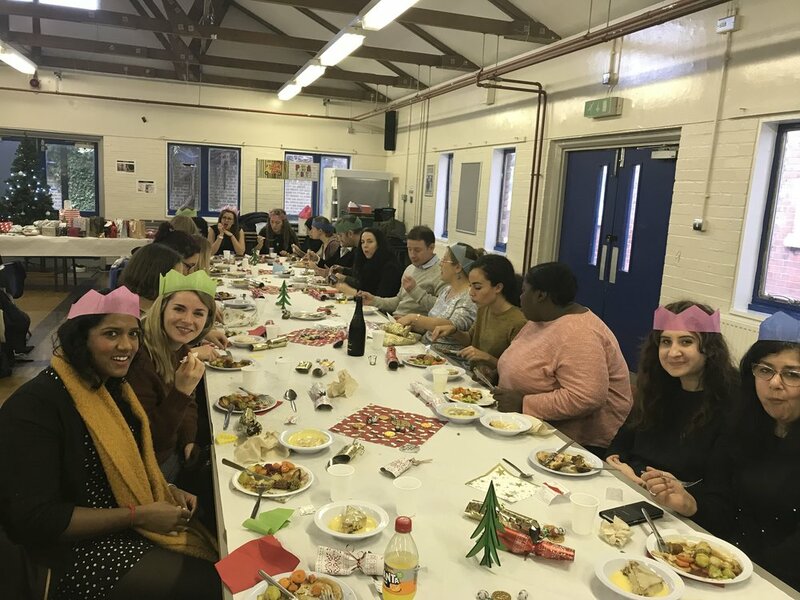 “Being part of H&F’s Youth Council is a fantastic opportunity and the young people who take it up are a great reflection on the depth of talent we have among this borough's younger generation,” said Cllr Larry Culhane, H&F Council's Cabinet Member for Children and Education. We are very proud to announce that our own Jeffrey Mailli was elected to the position of Deputy Member of the Youth Parliament. H&F’s first ever Youth Achievement awards produced a night to remember, celebrating the most impressive young achievers and talented young people from the borough. We are very proud of all our students who were nominated for awards and to Yousef Mechti, our former Headboy who won the Outstanding Achievement in Education Award. Nominations flooded in from peers, teachers, youth and social workers, ahead of the awards evening. A judging panel picked out the most deserving winners from a list of young people aged 11-25 who live, work or go to school in the borough – for achievements over the last two years. “These young people are the heart and soul of our borough. 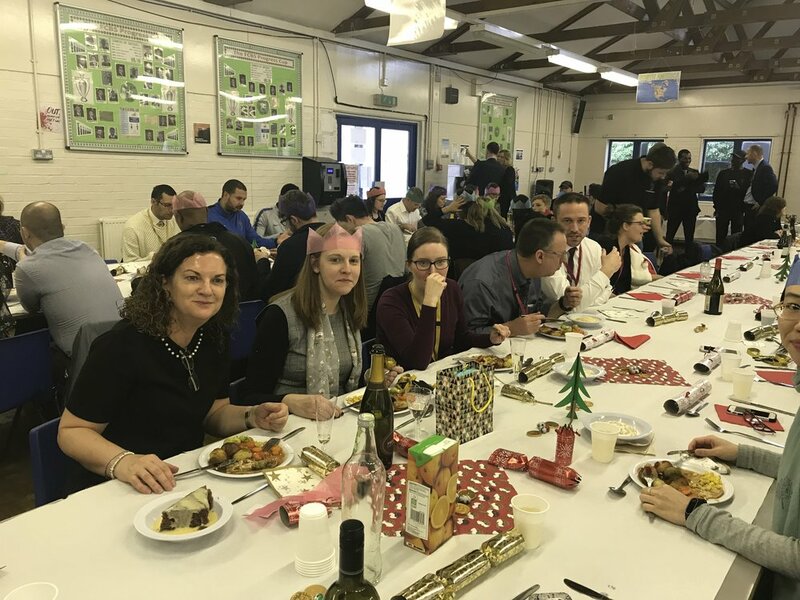 Their talents and achievements are a key part of what makes H&F a great place to live, work and study,” said, Cllr Larry Culhane, H&F Cabinet Member for Children and Education. The awards were organised with the support of the H&F Youth Council, and the Young H&F Foundation, with well over 100 nominations received from the public. The judging panel included people from local voluntary organisations, public services and businesses. Each category was sponsored by a company with a presence in the borough. As part of our World Book Day celebrations, we enjoyed a whole school reading activity; the whole school spent the first 10 minutes of each lesson reading a section of ‘The Hitchhiker’ by Roald Dahl. We were proud to welcome Seth Burkett. published author and former professional footballer, who hosted workshops for our Year 7 and 8 students throughout the day. 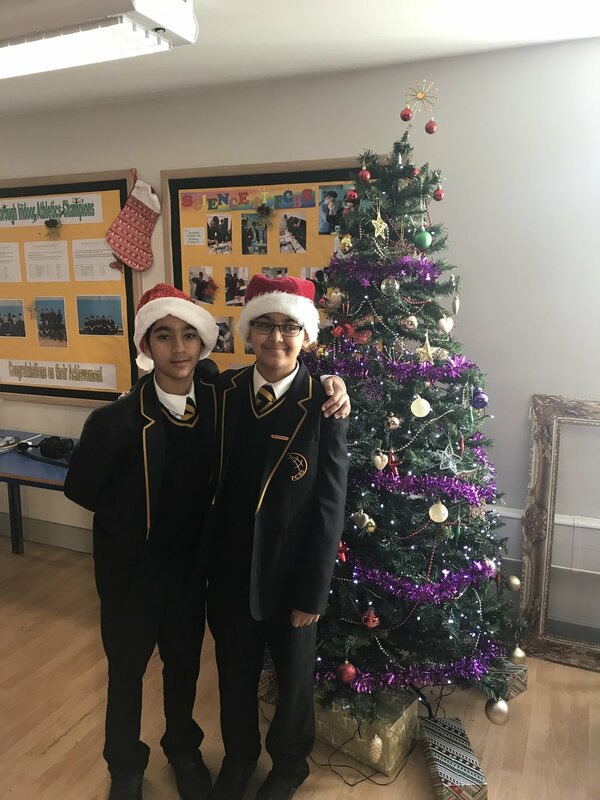 Some Year 7 students also visited their former primary schools, they had lots of fantastic book prizes that they gave out to excited Year 6 students. Staff and students were all dressed up as their favourite literary characters for the day. The school celebrated International Women’s’ Day on Friday 8th. All students were given postcards on which to write about a woman who inspires them. The Hammersmith & Fulham Mini Marathon trials were held at the Linford Christie stadium on the evening of 6th March. Eleven pupils from the school braved the poor wet and muddy conditions and completed the 2.5km race. We had two fantastic results with Carlos winning the under 17 event and Filimon winning the under 15 event. They will now go on to represent Hammersmith & Fulham at the 2019 Virgin Mini London Marathon to be held on Sunday 28rd April 2019. A special mention to Jamal for coming down to support the boys and to Reid who fell in the verge on his way out to the field but dusted himself off and carried on running. On Friday 15th February we welcomed HS2 into our school to conduct a day-long session to 60 of our key stage 3 students. The boys were sat in teams of four, and the first challenge was to design their ideal train station. The station had to include all normal amenities and had to be inclusive! From hover board parking stations to a breastfeeding room – our boys really used their imagination! They were challenged to think about the layout of certain areas within their station and how it would benefit or hinder passengers. 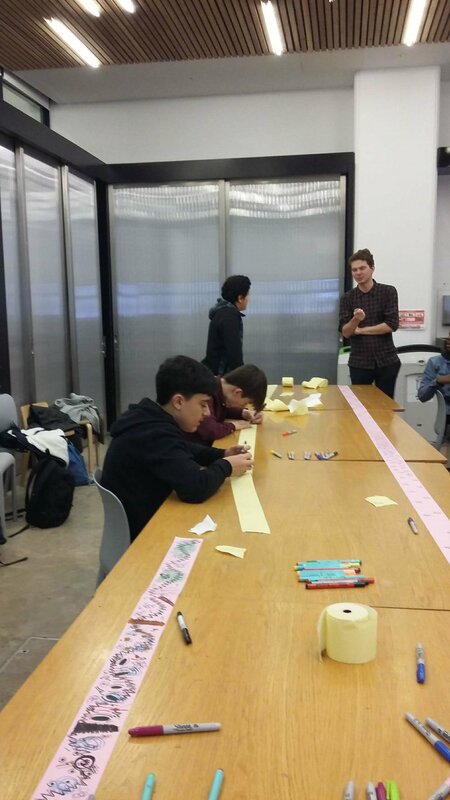 After lunch, each team was given a set of paper straws and masking tape. They had to create a tunnel for a train that could withstand a 1kg bag of sand being dropped it. Whoever designed the sturdiest, and the lightest tunnel won. 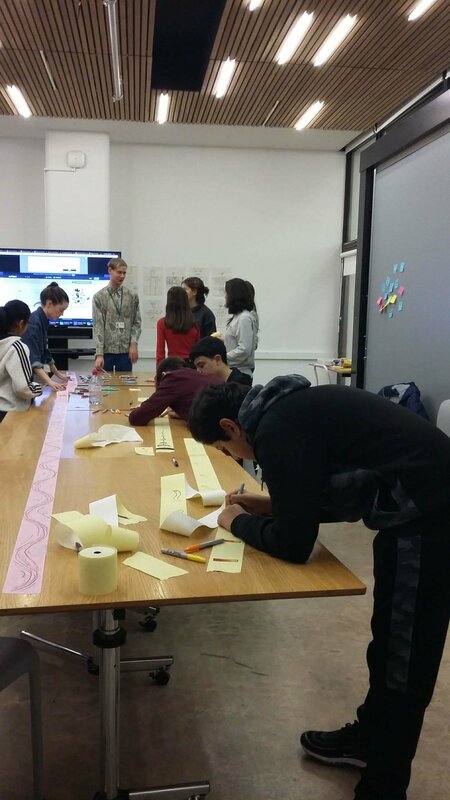 Eight teams managed to produce tunnels that could bear the weight – but the clear winners managed to complete the task with a 13kg tunnel – one of the lightest the HS2 had seen within schools! The day ended by playing a board game that compiled of creating a complex railway network over the map of the UK. It was a fabulous and the boys thoroughly enjoyed themselves! Thank you so much HS2 for visiting our school and putting on this great workshop. Well done to our Year 10 football team who won their match against The West London Free School last month with a 4-3 victory. After a long lay off over Christmas it was great to see our boys back in action this new year. With a fresh new look to the squad and an eager anticipation to play, it didn’t take long for FCBS to open the scoring with a good strike from distance from debutante Liam Humbles. Tariq Mugenyi added his name to the score sheet with a well taken goal for a 2-0 lead. Respect to WLFS as they were also playing a good game, they took their chances scoring twice in as many minutes, catching us on the back foot, scoring from close range with two similar goals to level the score. With the wind in the their sails, WLFS went on to take the lead 3-2 with a fine headed goal less than five minutes remaining in the first half. This was a valuable lesson and a timely check for the squad to witness how rapidly a good thing could turn sour in so little time. In the second half of the match, FCBS stepped out looking good, playing with confidence, patience, caution and a fair helping of flair recognising their opponents cannot win the game without the ball. This was executed exceptionally well as our goalkeeper was effectively redundant for the entire second half. This well crafted team effort, forced WLFS to play chase ball and inevitably led to something special. A fantastic build up and equally impressive finish from Dylan Stuart reclaimed the lead and ended the game 4-3 to Fulham College Boys’ School. Well done to all the players on the day, it was a truly fabulous game! Congratulations to the Year 8 Athletics team on winning the borough event last month. This is the second year in a row that they have won this competition, and this now means our team will be going on to the regional finals this March. Since October, students in Year 10 have been participating in an Art Project at the Victoria and Albert Museum. The project will end in July and an exhibition of their work and other schools’ work will be shown at Somerset House. The students involved are DeJuan, Tabishe, Callum and Ali. We are extremely proud of their commitment to the project, which they attend on their own initiative, and by being very proactive and creative with their work. Our Art teacher, Mr Santos-Martinez, visited the boys one Saturday back in December and witnessed how much they are enjoying the project and also how well they are doing. They are very fortunate to be working alongside Art practitioners, from graphic designers to animators. The V&A staff said they were very impressed with our students and that they would be really keen to take on more of our students next year! Well done boys - we are extremely proud of you. On 14th December, the Mayor of Hammersmith and Fulham visited the school to hand out awards to the winners of the competition to commemorate the centenary of World War I. Students across the borough were invited to enter either an individual or whole class work on the theme of WWI. Students could submit poems, prose or art. Tabbishe Ibrahimzadeh was one of the winners with his wonderful piece of art which depicts the famous Christmas truce. Year 8 student Alex Sunderland was also a winner with his lovely poem titled “One World”. Both these pieces were featured in the Remembrance Sunday Order of Service which took place on 11 November at the Fulham War Memorial. Every piece of work submitted by our students was truly inspirational and we are extremely proud of all our entries. The Mayor met with all the boys and handed out the awards to the winners. 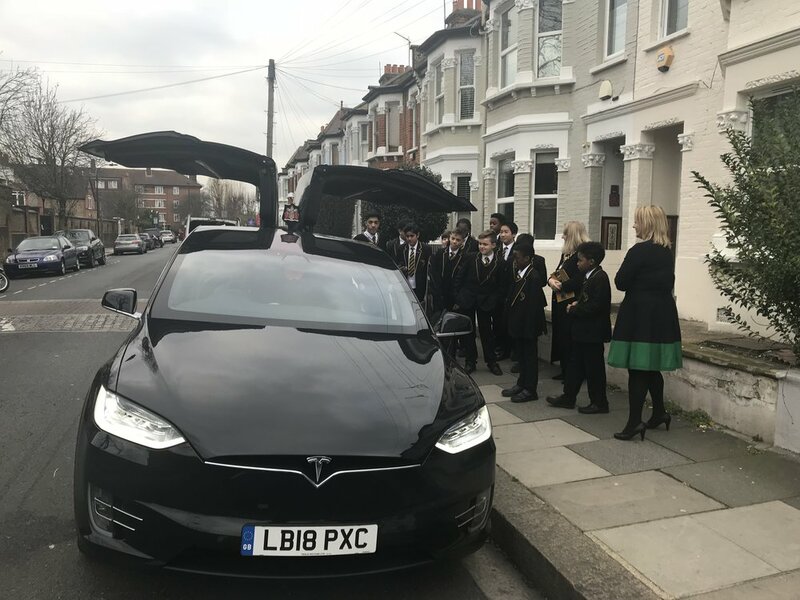 As an extra treat, the Mayor invited the boys outside to look at, and even sit in, her new Tesla! Thank you Mayor for coming to visit our school, it was such a pleasure to meet you and we are pleased to be able to welcome you back for our ACHIEVE Award Evening in March. On the 19th December, our annual Christmas Fair commenced during the afternoon. 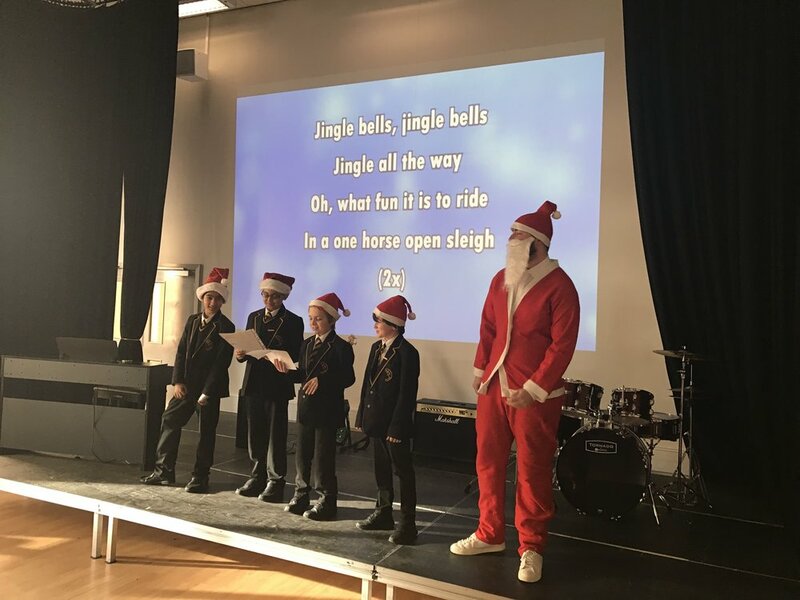 We had a plethora of activities for our boys, from our famous raffle, to our amazing sweet stands, to our ‘Beat Santa’ football competition. All staff and students got involved and the excitement from all was palpable during the afternoon’s events. Our raffle this year was a particular success – we had presents ranging from book vouchers and footballs, to board games and a cricket set! 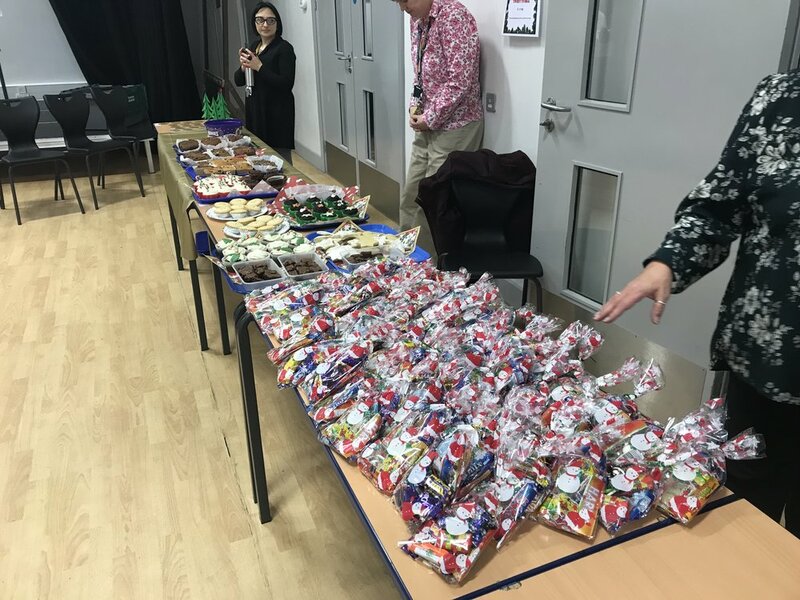 Thank you to all staff and parents who contributed to our raffle prizes and who gave up their time to ensure we had another successful event. 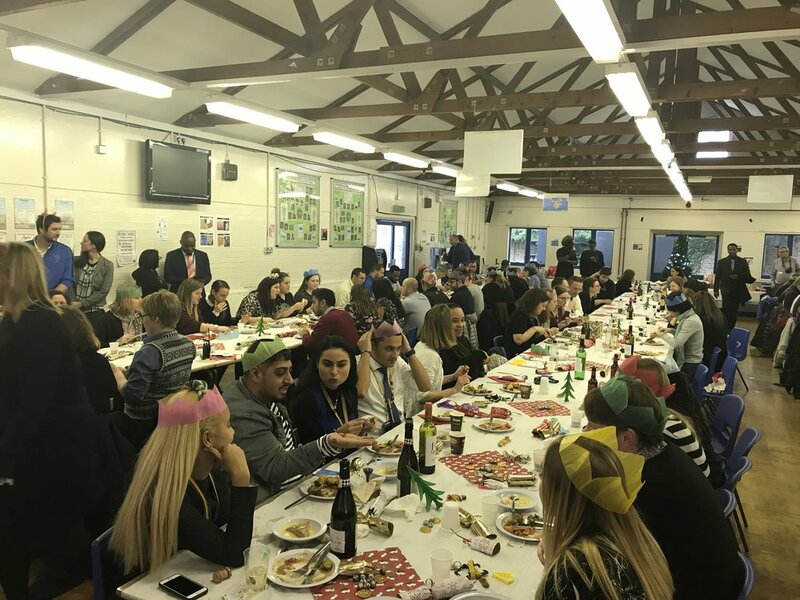 On Friday 7th December, the entire school participated in our termly ACHIEVE Day! Our ACHIEVE Days occur once a term and give the entire school a break away from the timetable to participate in various activities. Our Year 7 students went into central London to play the ‘Monopoly Board Challenge’. Students had to race against each to make it to every location from the famous London monopoly game. Next up, were the Year 8s who visited the National History Museum in the morning and then went on to explore the Science Museum! Our Year 9 students had a naval day out! They spent the morning visiting the Cutty Sark and then in the afternoon they all looked around the National Maritime Museum. Year 10 boys had a typical tourist day out in London! The morning was spent walking around Tower Bridge and the afternoon was a tour around the Tower of London. Last, but by no means least, our Year 11 students visited Poetry Live! The boys were lucky enough to hear poetry recitals from Simon Armitage, Carol Ann Duffy, John Agard, Gillian Clarke and Imtiaz Dharker – what an impressive line up! Everyone had a fantastic day and we were so impressed by the behaviour and conduct of our boys. We look forward to celebrating ACHIEVE in the Spring Term! 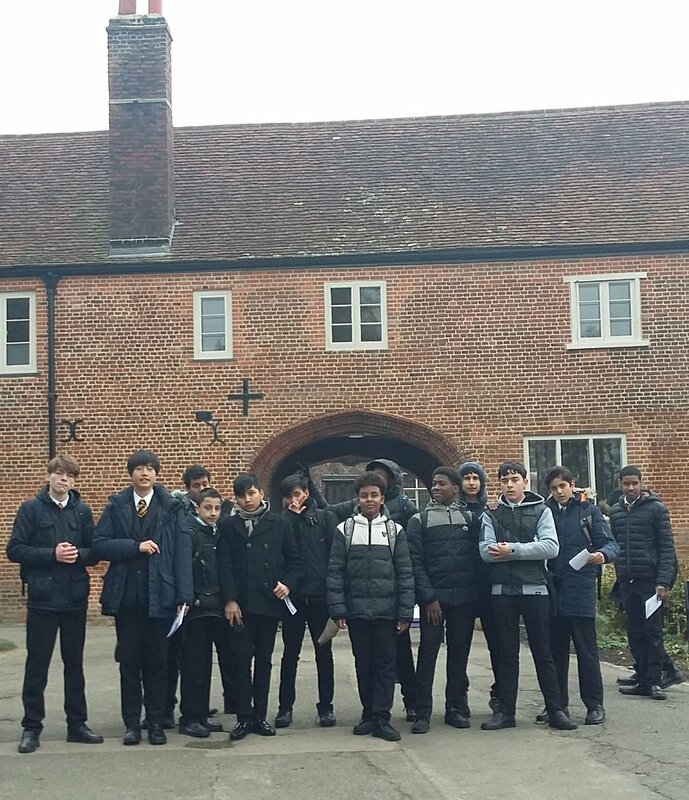 In December, our Year 10 Art GCSE class visited Fulham Palace grounds. The students took a variety of photographs which they will be able to use for their current Art project. They also had the opportunity to have a go at doing quick observational drawings, using only lines! Well done boys for your outstanding behaviour.